Bacon & Eggs in a Portobello Mushroom make the perfect breakfast or brunch. They are simple to make and have only 5 ingredients, most of which you probably already have on hand. 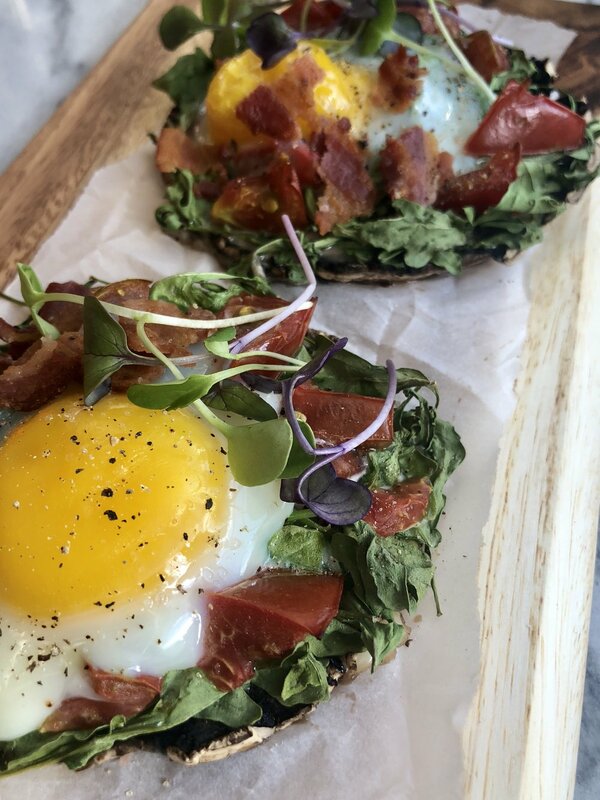 You are getting a great source of healthy fats and protein from the eggs and bacon, source of greens from the arugula, and veggies from the mushrooms and tomatoes. A balanced, and most of all TASTEY breakfast everyone will love. Tip!! Remove seeds from tomato to avoid soggy mushrooms. Also, if you aren't a big fan of arugula, swap for spinach. 2. Scoop out gills of mushrooms using spoon and discard. 3. Place mushrooms on baking sheet and fill each cap with arugula and tomato. Then, carefully top with an egg in the center. 4. Place in oven and bake for 20-25 minutes or until egg whites turn white. 5. Top with chopped bacon, sea salt and pepper.